2. Go to the I have a PDF file, use it! tab. 3. Browse or drag and drop your PDF file. 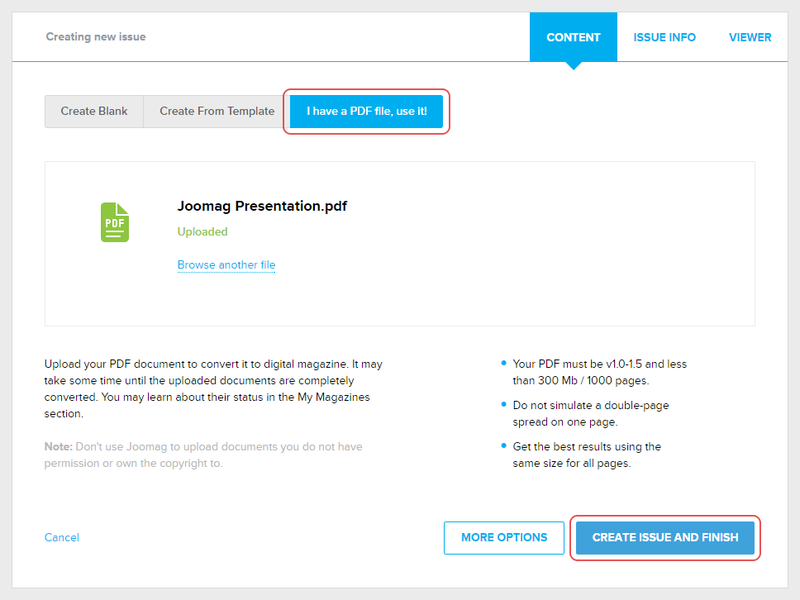 Important: Please note that PDFs uploaded to Joomag must be less than 1000 pages and 300 MB. For Enterprise/Campus - 450 MB. 4. After your file has been uploaded, click the CREATE ISSUE AND FINISH button and wait a couple of minutes until the conversion finishes. Note: You may even close the browser window and return later as the process is completely automated. Once the conversion is complete you'll find your new issue in the publication you have created it. Now you can enrich it with interactive elements like video and audio. Learn more about editing the content of the publication.